November 12, 2010 - Continuing a legacy of industry-leading aviation training programs, Jeppesen recently introduced a new Cessna 172 Total Training solution for the popular general aviation aircraft. The Cessna 172 Total Training solution incorporates learning situations from all phases of flight, from maneuvers to checklists, featuring an intuitive, easy-to-use design and layout. The Cessna 172 training solution is the latest addition to the successful Jeppesen Aircraft Total Training series, available in print and online instructional formats. The Jeppesen Cessna 172 Total Training solution provides a bridge for an issue common to aspiring pilots - the gap between traditional training courses and supplement guides that provide general flying principals, without providing details on flying specific aircraft. The new Jeppesen training solution provides the only guide with specific information that helps students and pilots learn how to fly the Cessna 172 aircraft. The Jeppesen Cessna 172 Total Training program allows students to familiarize themselves with procedures related to the aircraft organized by phases of flight as they occur in training. The program also follows specific checklists in a demo, guide and practice format presented in an interactive online environment. The specific cockpit of the Cessna 172 aircraft is used to familiarize students with the actual aircraft they will operate. ?The addition of the Cessna 172 Total Training solution to the Jeppesen Aircraft Total Training program works to provide student pilots with precise, detailed information they need to learn how to fly the aircraft they are actually using,? said David Wright, Jeppesen senior manager, Training Solutions. ?Pilots in training find that the Jeppesen Aircraft Total Training program decreases training time, due to a consolidated and improved presentation of information in printed materials and online formats, which can lead to overall cost savings.? The printed booklets provided with Jeppesen Aircraft Total Training solutions primarily cover maneuvers and checklists for the aircraft, while the interactive online component highlights specific aircraft maneuvers, procedures and systems. The Jeppesen Aircraft Total Training solutions also complement existing training courses and flight school programs through presentation of specific aircraft information and the ability to customize maneuver formats for training with specific flight schools. Jeppesen has also recently introduced several other online training courses, such as Private Pilot Online, Sport Pilot Online and Instrument Online to meet the needs of today?s students through online delivery of training information. 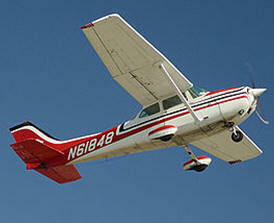 The Jeppesen Cessna 172 Total Training program will be available for purchase in early December.